The Poker Room at Thunder Valley Casino Resort | Lincoln, CA: $100K Reasons You Should Be at Thunder Valley on June 10th. $100K Reasons You Should Be at Thunder Valley on June 10th. 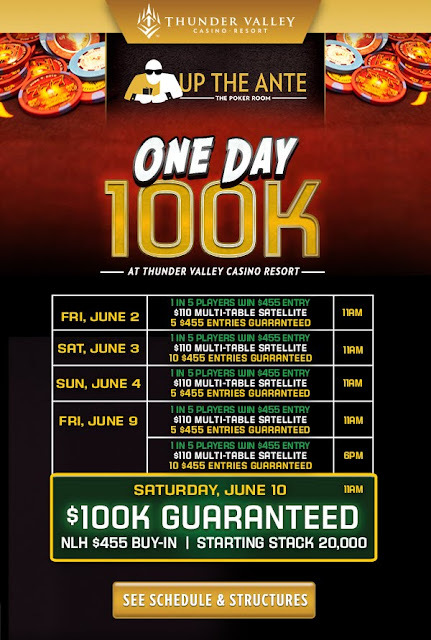 Thunder Valley will be hosting another One Day $100K on June 10th. Satellites take place June 2 - June 10, with 1 in 5 players winning a seat into the NLH tournament on Saturday, June 10. Registration opens at 1PM on Friday, June 9, 2017, with satellite play into the evening. Then, the $100K guaranteed tournament kicks off Saturday, June 10 at 11AM with NLH $400 buy-ins.